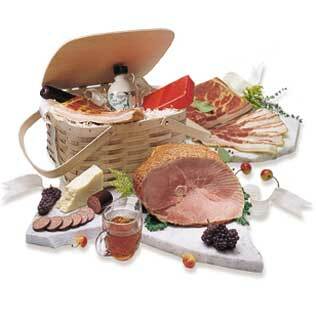 Ham it up with this lovely hand-woven wooden wicker basket (a $49.95 value) that is heaping with ham. This New England-style Family Picnic Basket contains our famous 7-9 lb. smoked ham, 2 lbs. of smoked bacon, a 7 oz. summer sausage, one pint of pure maple syrup and a 1 lb. block of Vermont sharp cheddar cheese. A great family gift for that special group.